From the makers of Coraline comes the story of Norman, a boy who must use his ability to see and speak with the dead to save his town from a centuries-old curse. In addition to spooky zombies, he'll also have to take on mysterious ghosts, wily witches and, worst of all, clueless grown-ups. But this young ghoul whisperer will soon find his paranormal abilities pushed to their otherworldly limits. Featuring the voice talents of Kodi Smit-McPhee, Anna Kendrick, Casey Affleck, Christopher Mintz-Plasse, Leslie Mann, Jeff Garlin and John Goodman, it's a frightfully funny and magically thrilling adventure for the whole family in eye-popping stop-motion. This was a fun film to watch over at our friend Katrina's house. I must say one of the things Hollywood is doing right these days is animated films. There have really been a lot of great ones in recent years. 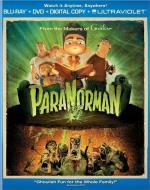 ParaNorman is no exception. It as very well-done on every level: good animation, clever dialogue, plenty of humor and scares, a genuinely creepy atmosphere, a couple of twists in the plot that you don't see coming, and great underlying message. Lots and lots of fun - recommended for everyone except very small children. Might be a bit dark for them. Safe for a movie night for a group where people have drastically different tastes in films. I hope you noticed that it's stop motion animation, not CGI. I did indeed. There have been a number of good stop motion films recently: Coraline, 9, Paranorman, Fantastic Mr. Fox. Don't think I said anything about CGI in the review - though there have been a lot of good CGI films too. Didn't mean to imply that you did, Danae. Just wanted to make sure you, and others, were aware that it was indeed stop motion. In most films, even the best, stop motion is usually quite easy to recognize. Not so in ParaNorman. And speaking of Stop Motion I just got the "Ray Harryhausen Gift Set". Loving it as you can expect. Just watched "20 Million Miles to Earth" and popping in "Earth VS. the Flying Saucers"
It was incredibly fluid and well-done. I can see how it would be easy to mistake for CGI.